High thermal efficiency, low fuel consumption, effective usage of heat and high mechanical stability are the most significant superiorities of SIGMA Dryer. 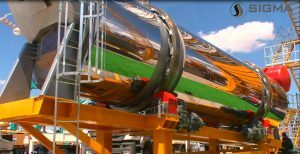 The drying drum is thermally insulated and covered with stainless steel sheets on the outer surface. The drum rings are manufactured out of special forged steel. The drum drive is friction type with four rollers that are individually driven through shaft mounted gear motors, enabling easy regulation of dryer rotation. Shapes and configurations of the blades inside the drum are optimally designed for efficient heating. Dedicated SIGMA monobloc burners, manufactured in Europe for SIGMA, feature optimized design for efficient burning, high thermal yield and minimum pollution. Varieties of different fuels such as light oil, heavy oil, gas or combination of them can be utilized at SIGMA burners.